Site admins often want to remove test orders from the DB before going live. Rows will need to be removed from 4 tables to completely remove the test orders. 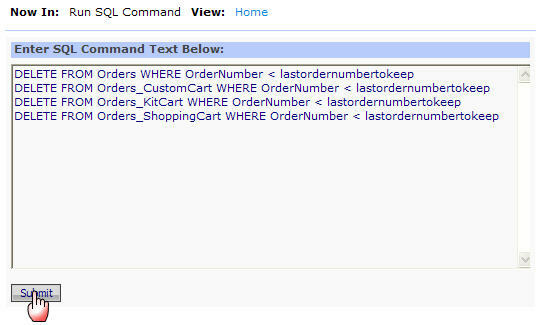 The following SQL statements will clear those orders out. Make sure you have a good backup of your database before making changes to it. 1. Go to Configuration → Advanced → Run SQL. 2. Type the following commands and click Submit. Make sure to replace 'lastordernumbertokeep' with the number you want to use. Note: These statements assume that you want to remove ALL orders before "lastordernumbertokeep." If that is not the case, you may need to edit these statements.